A clever movie that ends up being a mystery about a case for an animal police force. A fun, smart animated film that is about a world where animals do the daily jons of people and get caught up in the same kinds of mysteries that make for great detective stories. This one has two unlikely partners following the clues and jumping through the hoops to uncover some foul play. The humor works, and is pretty cute, but the storyline is what really pushes this movie into the realm of being something special. There’s a terrific mystery at hand here filled with red herrings, redirects, and some pretty cool plot twists. This movie definitely works. Zootopia is a fun movie. It’s a film that puts animals in the roles of cops, mayors, detectives, gangsters, and con artists, and tells a mystery that involves all of them. The movie is about a world where all of these animals coexist, prey and predator alike, and none of that is a problem for anyone. Or so it appears. Everything seems fine on the outside, and like this is really just a microcosm of our current society with animals filling the roles of humans, (it should be noted that unlike something like the Madagascar films, there are no humans in this movie.) Only everything is not fine, and some of the animals are going “savage,” which is basically like going nuts and reverting to their predator states. It’s up to one bunny rabbit cop to solve the case. That bunny rabbit cop is Judy Hopps, played by Ginnifer Goodwin. She lives on a farm with her parents and dreams of becoming a cop at the start of the film, despite her parents’ protests. When she graduates from the top of her class, she reaches a point of optimism where she can go after any dream of a job she wants. And so Hopps pursues being a cop and gets assigned to the ZPD (Zootopia Police Department,) where she is expecting to work on some major cases. Only the boss, Chief Bogo (voiced by Idris Elba,) doesn’t see it that way. He’s not too thrilled about having a bunny rabbit come to work for him, and he isn’t afraid to let her know it. Bogo assigns her to parking duty. That means riding around in a little go cart vehicle as a meter maid, assigning tickets. Hopps tells her parents on the phone, (using FaceTime on an iPhone,) and her parents rejoice that their daughter is doing the safest job a police officer can get. Only Hopps is disappointed with her assignment. Especially after she thinks she is doing some good, saving a guy named Nick Wilde, (a Fox, voiced by the uber talented Jason Bateman,) from some store clerks who seem to be trying to rip him off. It turns out Wilde is a con artist, pulling a scam on these clerks. When Hopps finds this out, by following Wilde and seeing what he does with the product she helped him purchase, Hopps feels worse than ever. She goes back to work as a meter maid, writing up tickets for anyone who crosses the time limit on their parked car and meter by even a second. This makes everyone she gives a ticket to hate her. And then Hopps witnesses a robbery by a Weasel and chases him into Hamsterville, where the two of them go running down the streets, trying to avoid stepping on the tiniest of creatures. It’s a great chase that ends in all kinds of destruction. She catches the Weasel, but in the process, causes all sorts of damage to property. And Chief Bogo isn’t exactly happy with the results. He wants Hopps out of the department. When a distressed Otter, (named Mrs. Ottertan,) shows up at Bogo’s door claiming her husband has gone missing, Hopps jumps on the case, saying she will help. Bogo tries to stop her, but the mayor’s assistant is right there, to tell Bogo that she is contacting the mayor with the news that Bogo is assigning Hopps a big case. This is sure to make headlines. Only Bogo isn’t taking any of this lightly. He wants Hopps out, and now she has found a loophole to stay on the force longer and take on a case that he never assigned her to. Bogo makes a deal with Hopps. She can pursue this case, and if she cracks it within two days, she can stay on the force and get better assignments. But if she fails to crack the case in two days, then she quits the force all together. And just like that, Hopps starts pursuing the case. She looks in the file and sees that there is only one small piece of evidence to go on. A photo of Mr. Ottertan, taken the last time he was seen. But Hopps notices something. Nick Wilde is in the photo too, doing business with Ottertan. She tracks Wilde down and blackmails him into helping her by recording him talking about how he doesn’t pay any taxes. Now the two of them are on the case together. Wilde knows that right after he left Ottertan, Mr. Ottertan went to a nudist club, and so the two of them visit the nudist club together. From there, they get the license plate of a car that Ottertan got into when he left the club. 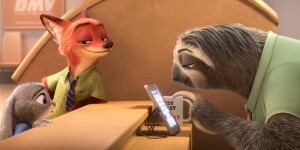 The two of them now visit the DMV and deal with a sloth employee who moves so slow, it drives Hopps nuts. Especially when Wilde tells the Sloth a joke and the Sloth takes the time to process it, laugh, and then retell it to another Sloth employee. The Sloth scene is absolutely great. And they characters eventually learn who the license plate belongs to. A gangster named Mr. Big. They go to see this gangster at his junkyard and a nearly iced, (killed,) when an event from earlier helps them out. Now they get some information from Mr. Big, about how the driver of the limo would know what happened to Ottertan. This middle section of the movie is basically following one clue after another. But all clues and interviews and characters that these two come across are pretty funny, and so the scenes work. 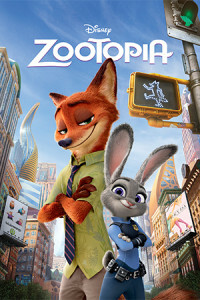 Hopps and Wilde have to travel into the Rain Forest District together, in order to find the driver of the limo. When they find him, he suddenly goes savage and attacks. Hopps is able to figure out from something that this character said, before he went savage, about “Night Howlers,” that the two of them should take a trip to visit the wolves. That’s where they find a whole bunch of other missing persons who have been imprisoned, and call in the other cops, to show off their find. So far, this movie has been kind of a simple mystery. The clues and characters were fun, but the story had no real angle or edge. All of that is about to change. Everything seems to be over at this point, with the Otter being found and returned home, and a villain being exposed as the responsible party who kidnapped all of these creatures. Only here’s where the red herrings and plot twists star it to kick in. Think of Gone Baby Gone, L.A. Confidential, or some of the other great mysteries. The case seems to be closed, the bad guys seem to be caught, and now a new wrinkle appears which points things in a. completely different direction. There is the inevitable conflict between Hopes and Wilde, two characters who have become friends at this point, and then it’s back to the case. The mystery is real, and it goes in some unexpected directions now, just when you thought the case was closed. The plot twists are surprising, and the story about the friendship between these two characters, is really put to the test after Hopps says some things to the cameras that she probably wishes she could have taken back. Let’s just say this movie become an allegory for racism and unfair stereotyping. Wilde gets it, personally, since he is a predator and it appears that it is only these predator creatures who are the ones going savage. Zootopia works as a fun, animated movie, and it also works as a mystery. In fact, one of the many things great about this movie is that it has a story which is strong enough that it could have easily worked for a live action movie. The red herring angle, just when you thought the case might have actually been solved, was terrific. And the basic idea about animals going “savage,” really works for this film, which exists in a world where such a thing seems impossible. The movie takes the predator – prey relationship and fits it into the mystery in such a way that character become suspicious of each other without even having reason or merit. And then we get this storyline about following clue after clue and going wherever the clues lead. It’s exciting fun. I love that this film goes more for the friendship / buddy cop movie angle than it does for the romance angle. Here’ a movie that knows what it wants to be and focusses on that goal, making sure to pull it off for the entire duration of the film.